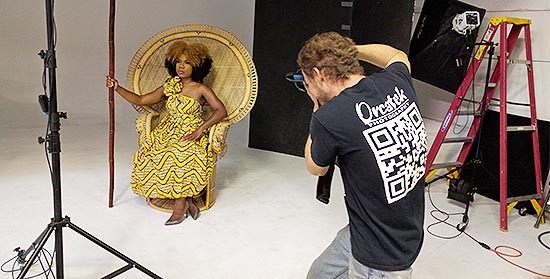 Here’s a behind the scene’s look at the Orcatek photo shoot for a private client’s modeling portfolio! Don’t just trust anyone with your modeling, acting or business photos. Especially for the entertainment industry, your photos, headshots and portfolios will either book you a job or get you passed by and onto the next model or actor. With your image and work on the line, give yourself a leg up above the rest of your competition by showing up to all potential jobs with a portfolio of professional photos from Orcatek! Let’s face it, your image is everything. This is especially true in business and attempting to sell yourself and services. This headshot for teen model, Jaden Sample will help her to book jobs and build her modeling career. Your headshot photo can be used on business cards, websites, social media, political ads, and for the entertainment world…your headshot and resume combined are what get you an audition or meeting to book jobs. With this being said, your headshot should be done professionally and not a quick picture taken with a cell phone. We have years of experience with photographing headshots for all fields of work! Actors, models, executives…now is the perfect time to update your headshot photos! It is very important to keep your headshot photos current and updated every few months. A fresh new look represents a fresh new you in presenting yourself to the world, future clients and potential jobs you’re trying to book. In addition, headshot photos are also used on dating sites…present the best images of yourself when looking for that perfect match! Been so busy I haven’t posted in awhile. This week was full of models coming in for portfolio updates. Some were experienced and some were just beginners. In between I managed to shoot a few headshots for a couple of executives. Over the weekend I taught my Introduction to Photography class. It was a huge success and I got several emails from students telling how I had helped them. Summer is here and it is hot, hot, hot! To start it off the week I shot some fitness photos of a model for a calendar. And of course to keep the heat on we had plenty of boudoir photography sessions taking place. This shot of August was just a little tease. And to end the week a fun newborn photograph is always a favorite. I will teaching my Introduction to Photography Class this weekend. I always have a good time teaching. I photographed a lit bit of everything this week, which makes for a fun week. As usual I got calls for headshots that were needed right away. I usually can squeeze a session in same day if the client is flexible on time. Several boudoir photography clients came in to create that special gift for the man in their lives. One was a bride to be who wanted a bridal boudoir session to create a grooms gift. Another was celebrating an anniversary. And one was just about to turn 40 and wanted to get the photos done to celebrate. It made for an amazing week. Maternity photographs were also in high demand this week. One of the lucky moms was going to have twins. I’m looking forward to her return for her newborn photo session. A new model came in to get some new photos for her portfolio. She was just a beginner but was great fun to work with. My new website for my photography workshops is finally available. Check it out.